This is my girl Megan. 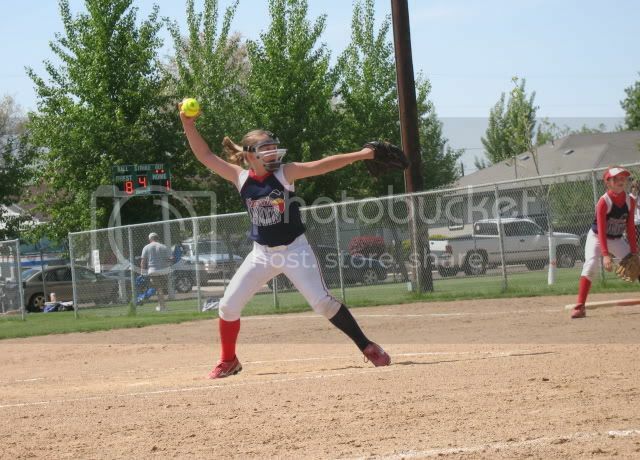 She's 10U this year but the photos are of her playing up to 12U for a local tourney. These images are from a couple of different pitches (sorry no video). If you could offer us any advice based on what you see here...we would really appreicate it. Also, she's 11 years old , and had a top speed of 46 over the winter. Right now, we are working on hitting spots and perfecting her change-up. Thank you. The main thing I see, with limited vision, is her back foot with the red sock has way too much foot dragging on the ground. More foot on the ground means more anchor holding her back. She should really work on gliding across the top of the ground rather than digging a hole to china with the side of her foot. Concentrate on keeping her shoe laces pointed to the catcher.. that will mean her tip toe is pointed to the ground, not the side of her foot. Tell the firstbaseman in the first pic to pay attention!!!! Tell her the reason that Monica Abbott throws so fast is that she wears the same color of socks on both feet. 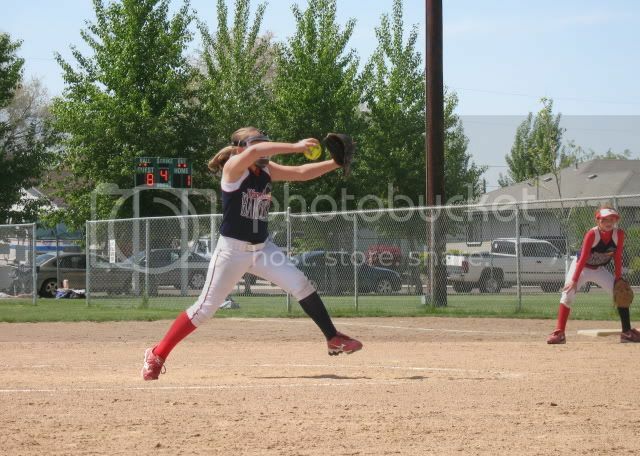 In picture #1, she has a bend in her elbow. 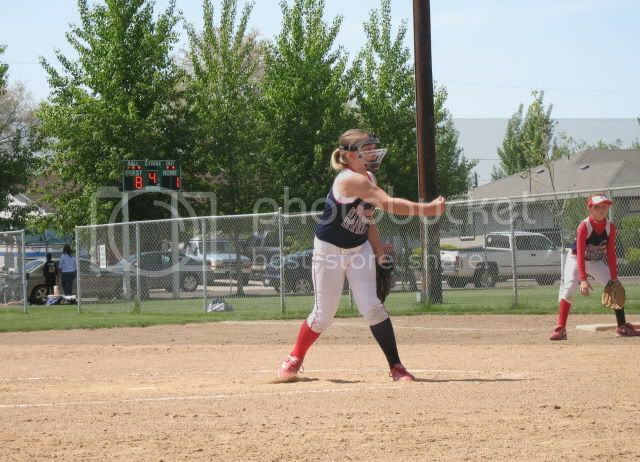 The right arm needs to be straight. The arm should be straight at the top, and she pulls down with her elbow from the top. She wants her hand as far up as possible. 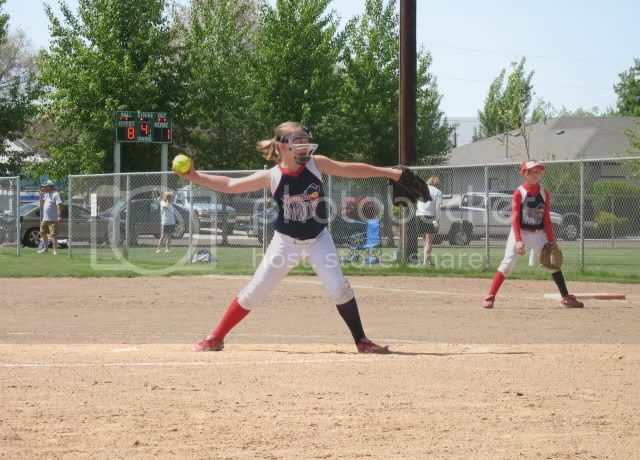 In picture #2, she has a bend in the elbow, which is OK at this arm position. BUT: her left foot is down, and it should be off the ground. In pictures #3 and #4, she is moving her upper body forward. She needs to stay back. Please, post a video--one from the side and one from the back. We need to take a look at her foot work. Thanks. That gives me some stuff to work on with her.